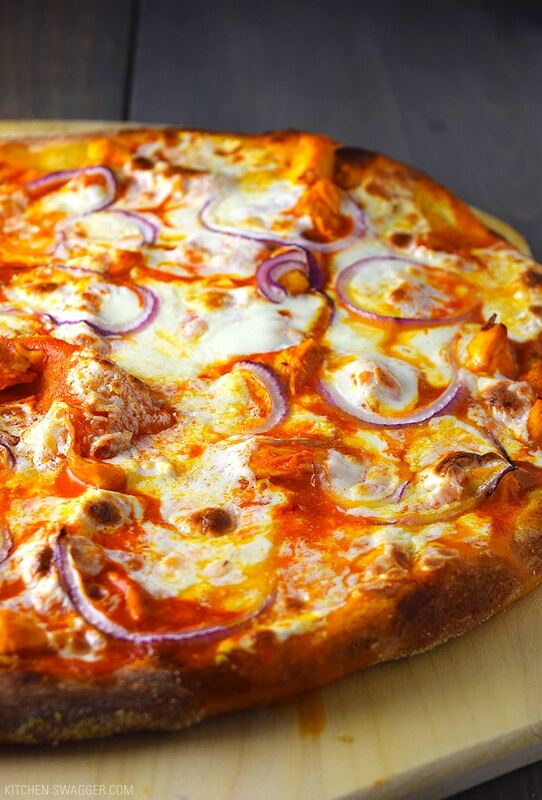 Buffalo chicken pizza made with fresh mozzarella and buffalo sauce. 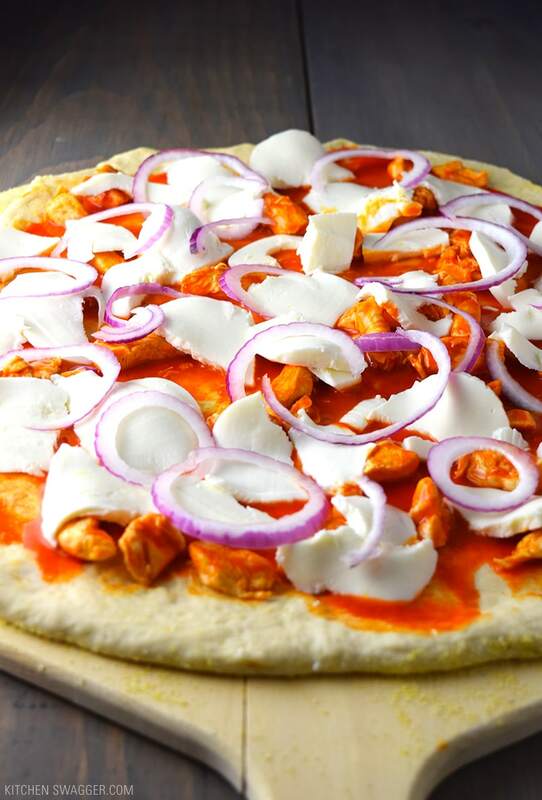 I keep buffalo chicken pizza simple. 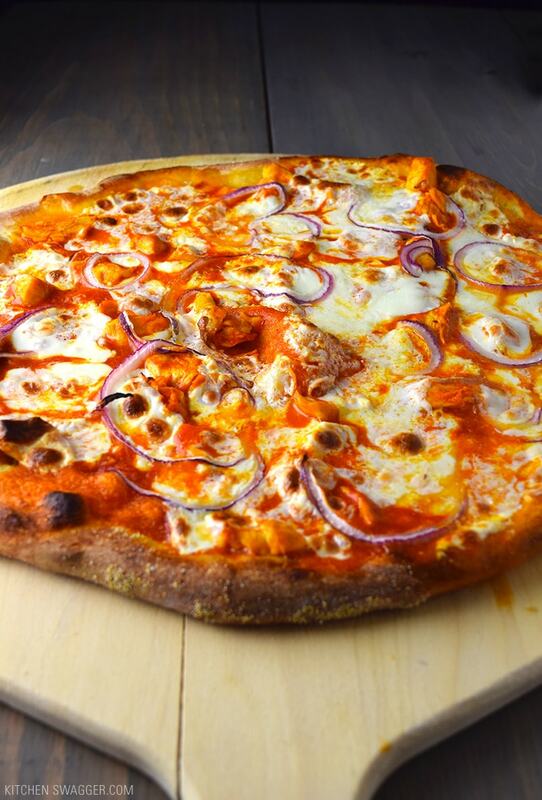 Chicken, fresh mozzarella, red onions, and buffalo sauce. I started experimenting with fresh sliced mozzarella on buffalo chicken pizza and I really like the result. It’s fresh and feels “gourmet.” You can use crispy fried chicken slices, grilled chicken, or simply sauté chicken on the stove top in a little buffalo sauce. Chicken must be fully cooked before topping. Your buffalo sauce replaces any form of red sauce. If you find a nice mild buffalo sauce it won’t create an inferno in your mouth. If you don’t have any buffalo sauce on hand you can make it easily using regular hot sauce. I cook all my pizza using a pizza stone. 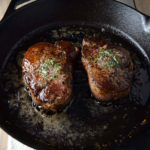 I heat the stone up for one hour in the oven at 500° F before baking (If you’re pressed for time 30-45 minutes will do. Throw the pizza in the oven and cook for 10-15 minutes for the perfect finish every time. 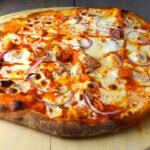 You can read more about this method and how to make better pizza at home here. Preheat the oven to 500° F and place the pizza stone in the oven and let preheat for one hour. Meanwhile, cut the chicken into bite sized cubes and cook on medium heat in a small saucepan. 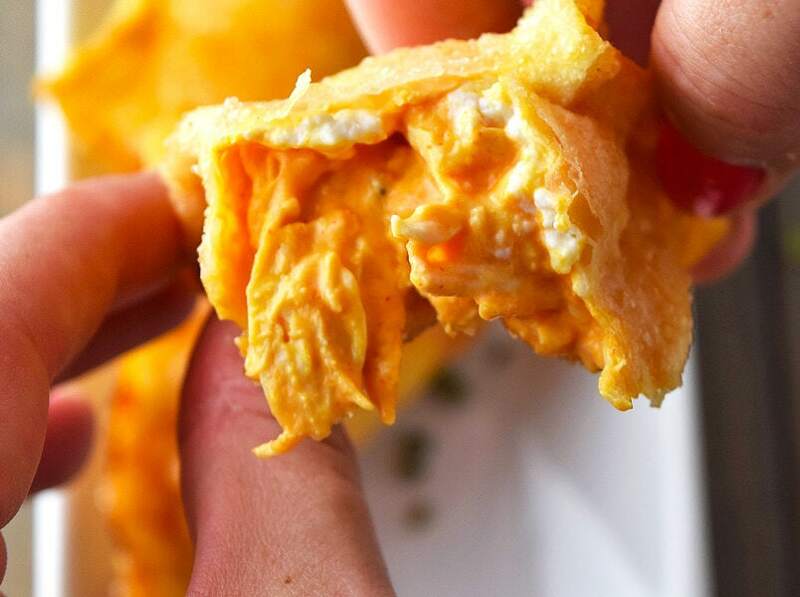 fully cook and drizzle with 1-2 tablespoons of buffalo sauce until lightly covered and set aside. Roll out the dough into a 12 inch crust. 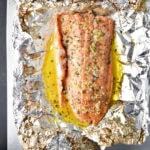 Sprinkle evenly with 1 teaspoon of garlic powder or to taste. Place a small handful of cornmeal onto the pizza peel and spread evenly to prevent the dough from sticking to the pizza peel. Transfer the dough onto the peel. 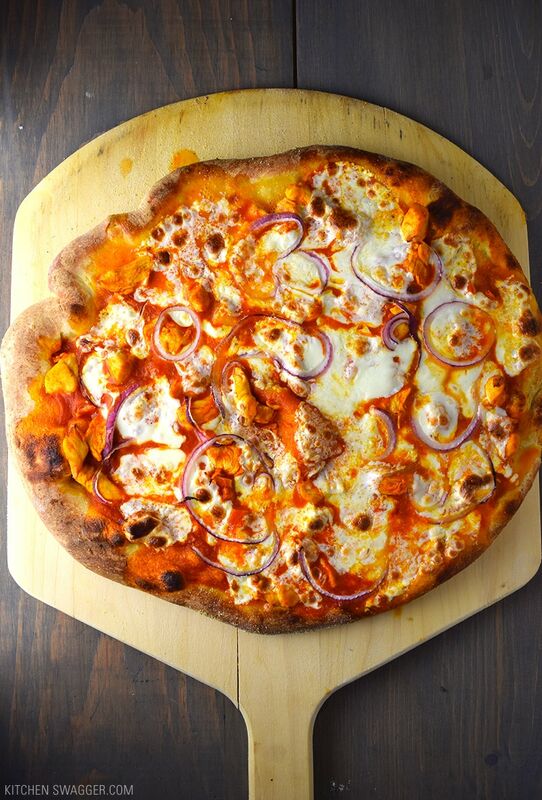 Evenly coat with buffalo sauce leaving a ½ inch crust. 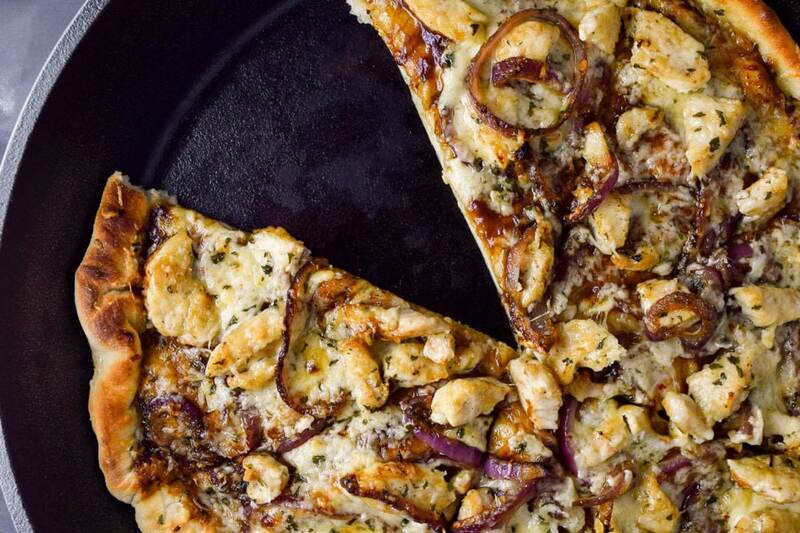 Add the chicken, fresh mozzarella and finish with sliced red onion. Slide finished pizza onto the pizza stone and bake for 15 minutes. Be sure to carefully watch the oven because all ovens will cook at different rates. 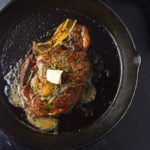 Sometimes it will only take 10 minutes to fully cook. Remove from the oven, let cool and serve. I don’t want this pizza, I need this pizza. And it’s not even 9 AM. But seriously, this looks amazing! 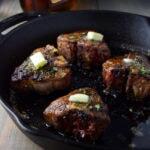 I’ve gotta give this recipe a try ASAP! Haha thanks Karly. I feel like I torture myself when writing these posts…I want them all over again! 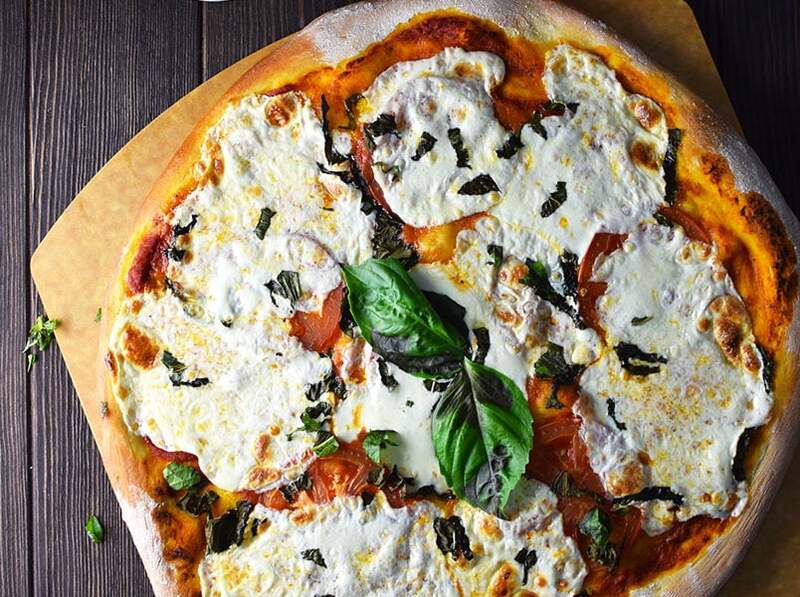 What kind of pre-made pizza dough do you use? Ive tried a cpl different ones but found them to be kinda blah. Yours looks very appetizing. I love ❤️ Buff Chick pizza ? Hey Heather – I use Portland Pie brand. It’s a local New England restaurant so I can get it at the grocery store. Not sure where you are. Otherwise, I really just use anything. I would try making your own and see what happens. Also, thinner crust may help from it being too much dough. 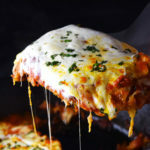 It is great pizza recipe.I like to eat pizza of different varieties. I will try this one.Great work keep it up..! !